at peace with ourselves and each other. and therefore, more likely to respond positively to the good examples we set. but, with persistence, results will come. "Road-Peace is a step on the road to World Peace." while acting locally (with kindness for everyone around us). to treat each other with courtesy, respect and patience. more self-indulgence than cooperative effort! make our roads much safer, and more pleasant to use? It is in our own best interest! 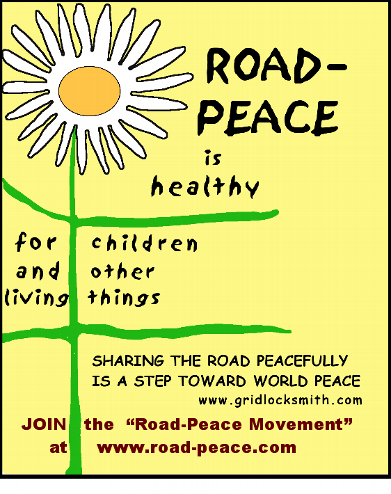 This site is a place to share ideas and resources for spreading the message that Road-Peace is a step toward world peace... and provides a peace making opportunity for every person, every day that one is in traffic. Any one can design an ad for publication, and have it posted here, (Include your credit, on the ad, and send a link to be posted with it.) for others to view and contribute funds for its publication. Any one may come to the site to browse the contributed ads and donate funds to make publication possible, or, download the design to have it published (please, keep us informed), or, you can even make copies to post on bulletin boards or neighborhood newsletters, whatever... dissemination is the goal. Create home-made posters for local bulletin boards and store windows. Get others to chip in to place an ad in the local paper, or other media. Or cut it in two. We can't expect our children to take more steps toward World Peace, than we are willing to take, ourselves! Just as we looked to our elders for examples, our next generations will all do the same. Will we show them how to take action for Peace? Begin by setting peaceful examples through kindness, patience, forgiveness, thoughtfulness and love.